I am so glad when Makeupuccino asked me to make a review about LASplash Cosmetics. One of the makeup companies which also launched makeup product a durable liptint with beautiful colors. Lip couture is one of their flagship product. It could be said this is a dupe product from similar products, like Lime Crime, Too Faced Melted, OCC, etc. 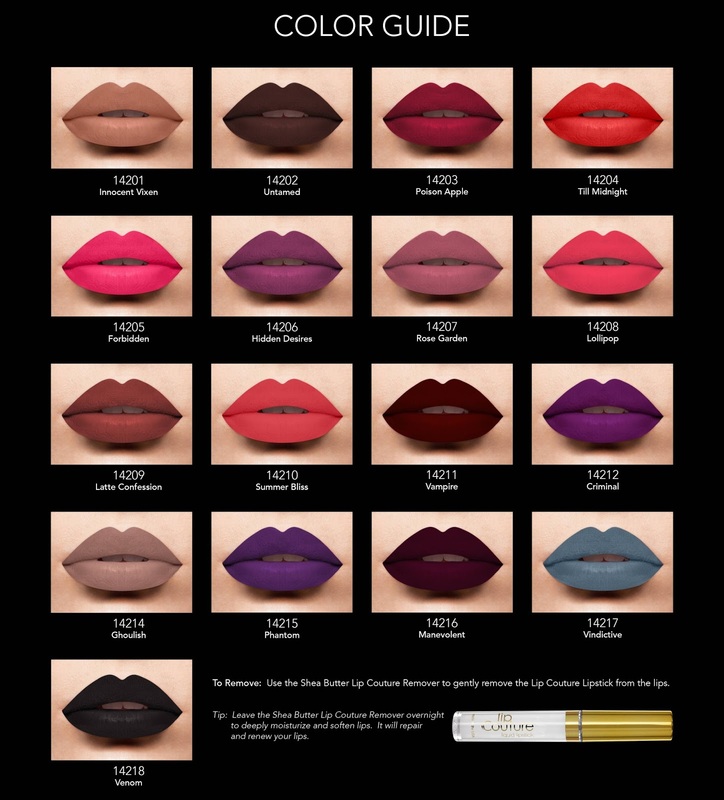 There are 10 beautiful shades of Lip Couture which you can order at Makeupuccino, including Lollipop, Rose Garden, Criminal, December Coral, Untamed, Till Midnight, Latte Confession, Phantom, etc. 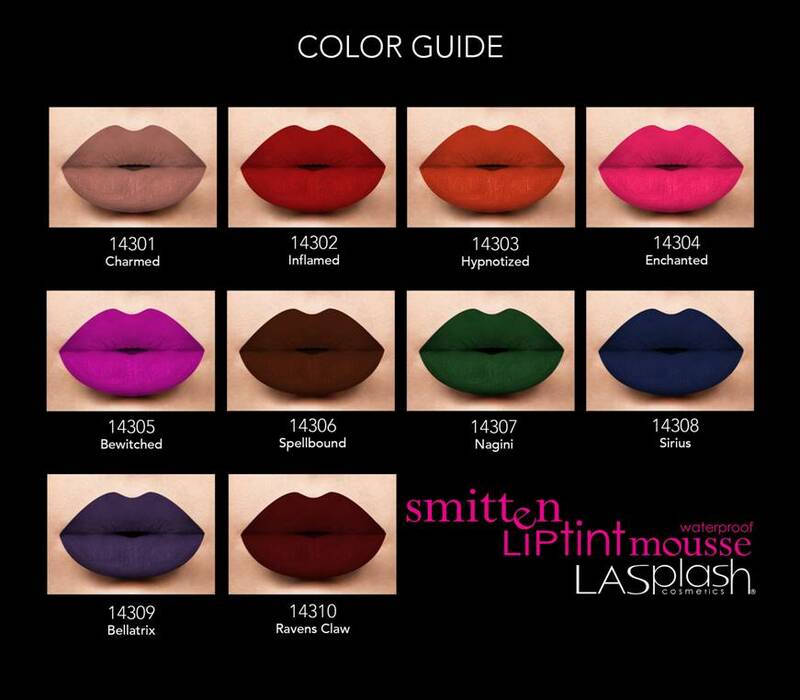 And there are 3 colors of Smitten Liptint already ready stock, Spellbound, Bellatrix, and Raven Claw. The other colors will come next month. Hihiiiiii... So, be patient. 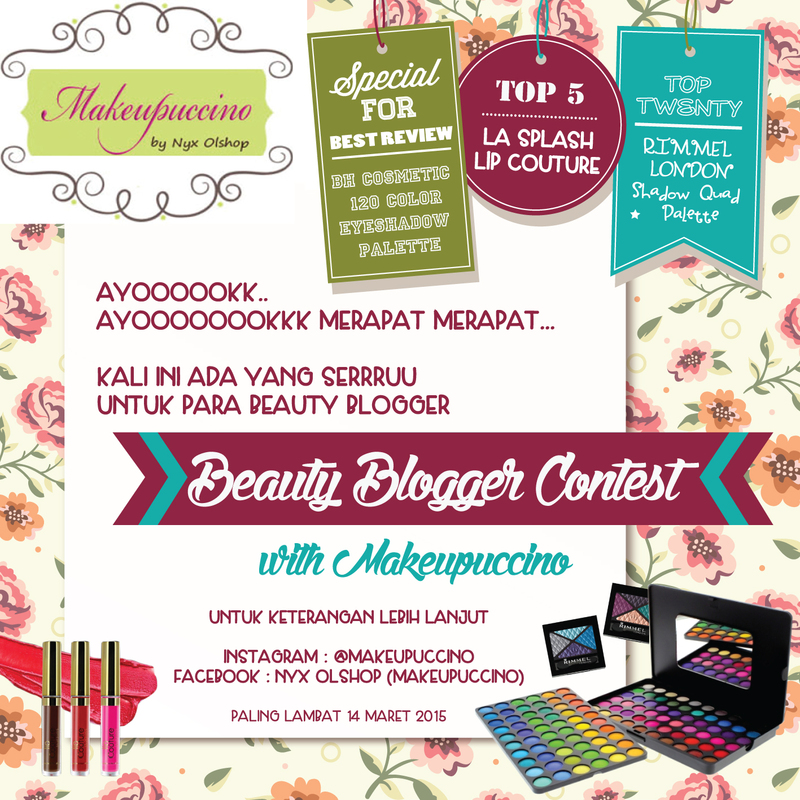 Makeupuccino send me 6 kinds of LASplash Cosmetics products, there are 5 Lip Couture and 1 Smitten Liptint Mousse. Im so EXITEDDDDD.... I can't wait to try these products. So, let's take a look at the review. C10-12 Alcane/cycloalkane, Trimethylsiloxysilicate, Dimethicone, Silica Dimethyl Silyate, Quaternium-18 Bentonite, Propylparaben. May contain: CI 77019, CI 77891, CI 15850, CI 45410, CI 77492, CI 77499, CI 77491. External packaging is made of mica plastic, and packaging made of glass. So keep it carefully so as not to rupture. Make sure your lips is moist before using this product. The basic colour is pink but there is little content of orange in it so that the result be bright pink. Suitable for white skin, in my opinion this color is not for brown skin. *Lighting can raise and lower the quality of the color. Above is the same color with different lighting. So we can guess how the real color. The bright purple color, suitable for use on makeup characters (cosplay). Concentrated texture once swab already covering our lips. Like dusty pink (pale pink). For best results, use a thin layer and stack again with the another layers. A regular bright pink. For best results, use a thin layer and stack again with the another layers. I love this color. Looks like a light brown (beige) but there is a slight impression pink color in it. Suitable for all skin colors and for everyday look. Impressed as dark red, but the real color is dark brown. One swab is enough for covering the whole lips. I prefer to use a lip brush when applying this product to get perfect result. Take you time, don't rush when applying this product to make more presentable result. When removing this product, compress your lips with makeup remover (oil based) for a few minutes then gently massage until the entire product fall of. Hopefully this revie could be useful. Have a great day beautiful. God bless you. 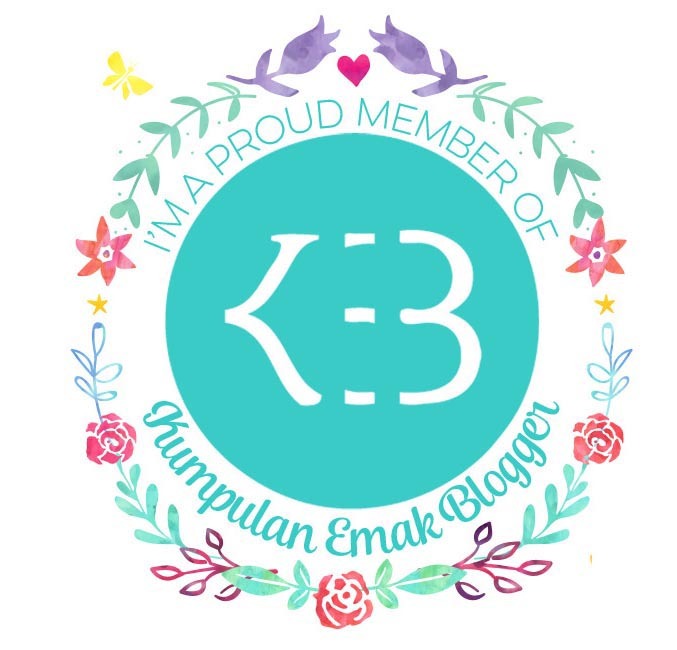 DON'T FORGET to join Makeupuccino Giveaway, 1 pcs BH Cosmetics Eyeshadow Palette 120 Color for 1 winner, 5 pcs LASplash Lip Couture for 5 winner, and Rimmel London Shadow Quad Palette for 20 winner. 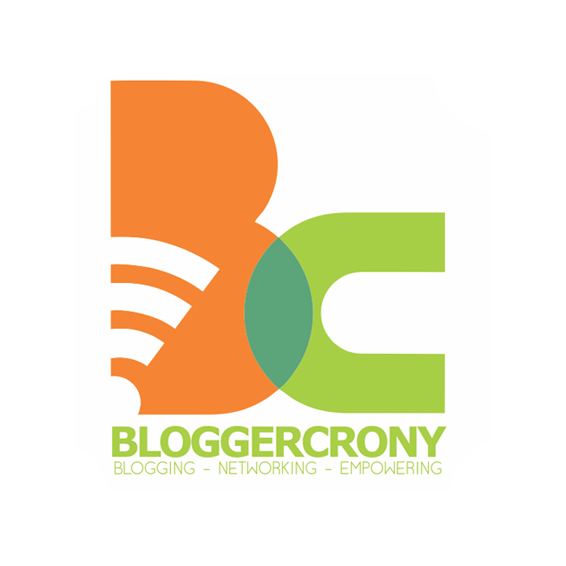 duhh lengkap banget infonya kak..kebetulan aku lg nyari2 info merk ini bagus nihh kayaknyaa..makasih ya kakak..
Haiii Wen (boleh ngintip namanya dr blog hihihiiii) terima kasih juga sudah mampir yaaa... Blognya udah di visit loh, dah follow juga.. hehehehhe. 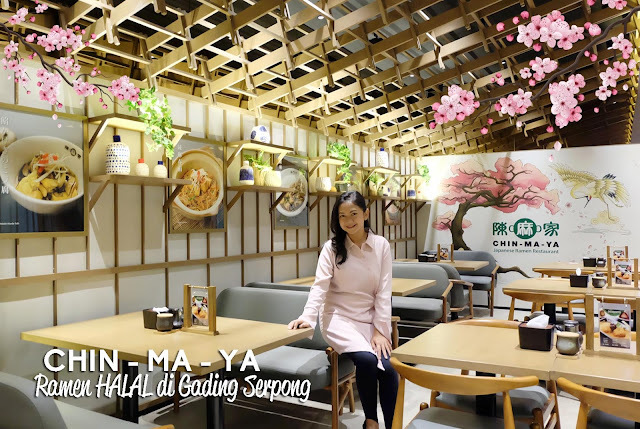 Jangan lupa ikutin giveawaynya yaa.. Have a nice day. Hi, I have both Too Faced Melted and LA Splash Lip Couture/Tint Mousse..and IMHO those 2 are a totally and completely different product. The only similarity is that they are both liquid. While the longevity, finish and everything else are different. I know that the two products are different, I just gave an overview if both are equally liquid lip product. Quality of both products and compositions certainly was very different. I still use Lime Crime and I used the OCC and Too Face Melted too. In Indonesia, Too much Melted Face sold for IDR 330.000 (about $ 27.5), Lime Crime almost IDR 400.000 (about $ 33.0), it's soooooo expensive huhuhuhuhuhu (--__--)" ... while LASplash costs IDR 150.000 LASplash (about $ 12.5). The price determines the quality of the course. Terima kasihhh ya Lady hihihihi.. Hayooo monggo diicip juga hiihii..